Microsoft released Windows XP on Oct. 25th, 2001…10 years ago this week. You can’t buy it anymore, Microsoft was forced by consumers to extend support for it until 2014 (despite the pleas to upgrade), and it’s still being used by the majority of the world’s PC’s. Why is a decade-old operating system still being used by so many people? Users will say things like “It’s simple. It’s reliable. 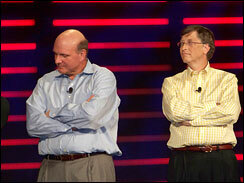 It’s familiar…”; but the real reason Windows XP is still around: The Internet. In the 80’s and 90’s, it was all about hardware. Faster processors! Larger hard drives! More memory! People upgraded their computers with the same passion that car enthusiasts put into their hot-rods. Those PC’s needed the extra horsepower to run essential software such as Microsoft Office, Lotus Notes, or Doom smoothly. In the mid-90’s however, people started using their computers in a different way: online services AOL, Prodigy, and even my home-base TOAST.net had people dialing in to take advantage of online apps and content. Dial-up connections were the only affordable way to take advantage of these services, and while the connection speed was fine to download small bits of information, a majority of the work was still done on the computer. The turn of the century saw the broadband revolution. High-speed connections for businesses and consumers took hold, meaning rich on-line content could finally be pushed down to the computer in a timely manner. Windows XP made its début around the same time frame. XP’s beefy hardware requirements pretty much ensured you were getting a powerhouse computer out of the box, and the pairing of high-speed Internet with powerful PC’s turned out to be a perfect match. More and more complex online applications were made available, and “always-on” Internet meant that less had be stored locally on the computer. When exactly are these people going to upgrade???! Fast forward to today and we have a world where the Internet is essentially a giant hard drive, and we’re running all of our applications from it. Computers are being used as “dumb terminals”, and even though we’re 10 years after Windows XP’s release, hardware requirements have actually stayed about the same. Windows XP features the best of both worlds for Internet use: enhanced security to block Internet threats (it took a couple of service packs to get it right though), and it can run advanced web browsers. Physical media such as CD’s and DVD’s to install and run software locally are quickly becoming a thing of the past. Taking its place are web-centric applications such as Google Apps and web-based email. Entertainment is coming from YouTube and Netflix instead of TV and movie theaters. Music and books are being distributed from Amazon and iTunes instead of the radio or stores. All you need is ANY working computer to get to your stuff, and a lot of Windows XP systems are still working. If it runs in the cloud, your operating system doesn’t matter as much. This is why a lot of the world is still using Windows XP: nothing has come along that forced it out. There were no “Beta vs. VHS” or “CD vs Cassette” or “Blu-Ray vs. HD-DVD” wars to convince people they need something better, and XP still handles the basics just fine. All good things must come to an end however, and Windows XP is just about at that point. Microsoft will not allow you install anything higher than Internet Explorer 8, and older browsers can introduce security risks. XP’s built-in firewall isn’t the best, and there’s not much in way of malware protection included. HD video is probably out of the question with the hardware requirements. Built in applications like Outlook Express are prone to security hacks and viruses. As a whole, it’s not the safest thing to use on the Internet in 2011. Much like the guy you see driving on the highway in a car covered in duct-tape and rolling on two spare tires, his car may still get the job done but I’m not sure I’d feel safe driving it. 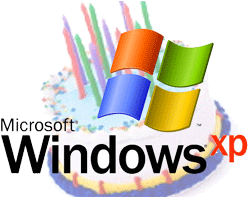 So, Happy Birthday Windows XP! I hope you enjoyed the party, but it’s getting late and there’s the door. Goodnight. One thing you didn’t mention in the article on XP was that it is STABLE. 98 was fairly stable as well but had its issues being a DOS-based OS. There was a reason we said NT stood for “Not Today”. 2000 and ME were terrible for reliability. Vista, well, let’s not even get started on that. My new laptop has 7 (Vista-fixed as I call it) on it as well as the desktop PCs I purchased (had to replace due to hardware failures) for my wife and I and the kids. Some things are easier to take care of, but some things are harder to navigate and are “buggy” – like filling out PDF forms in the newest Adobe reader many times (over 50%) causes blue screen errors. You also can’t find what you are looking for if you want to change advanced settings as easily. I also don’t like the way 7 is not as compatible without spending lots of extra money to upgrade the OS. Home Premium should mean the best for home use, but you have to go up to Professional ($90 increase) just to run certain things I have that will run on 7 but won’t install on 7 because it is older software (16 bit installers). My company laptop (an old Dell D630 workhorse) as well as the old IBM laptop I handed down to one of my daughters to use (for now) has XP on it and they both work flawlessly. That is why many businesses are still using XP – it is STABLE and doesn’t require as much maintenance. Non-IT businesses can’t afford the downtime caused by newer OS issues. I will admit that 7 looks like it may be getting closer to the point that it is stable, but time will have to tell. Next Next post: The November Roadmap: Good Stuff Ahead!